For the Bábí and Bahá'í religious figure, see Báb. 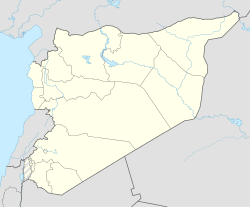 Al-Bab (Arabic: الباب‎ / ALA-LC: al-Bāb) is a city, de-jure administratively belonging to the Aleppo Governorate of the Syrian Arab Republic. As of December 2016, the city came under the control of pro-Turkish militias, as part of the Turkish buffer zone. Al-Bab is located 40 kilometres (25 mi) northeast of Aleppo, 30 kilometres (19 mi) south of the Turkish border, and has an area of 30 square kilometres (12 square miles). Al-Bab has an altitude of 471 metres (1,545 feet). According to the Central Bureau of Statistics (CBS), it had a population of 63,069 in 2004. Prior to the Syrian Civil War, al-Bab's inhabitants were composed of Sunni Arabs and Arabized Kurds[better source needed], thus being much more ethnically homogeneous than those of the neighbouring city of Manbij. Al-Bab is the administrative center of the Nahiya al-Bab and Al-Bab District. Al-Bāb in Arabic means the door. According to Arab geographer Yaqut al-Hamawi in 1226, the name is a shortening of Bāb Bizāʻah (the gate to Bizāʻah). Bizāʻah (also Buzāʻah and Bzāʻā) is a town located about 10 kilometres (6.2 miles) east of Al-Bāb. During the Roman Empire, Al-Bab was a civitas of the Roman Province of Syria, known as Batnai. The ruins of that settlement lie on the banks of the wadi 1 kilometre (0.62 mi) north of the modern town. Roman Batnai should not be confused with the Roman town Batnae about 70 kilometres (43 mi) northeast. Al-Bab was conquered by the Arab army of the Rashidun Caliphate under caliph Umar ibn al-Khattab in the 7th Century. It received its name, meaning "the Gate", during Islamic rule as it served as "the gate" between Aleppo and the adjacent town of Buza'ah. The tomb and shrine of Aqil ibn Abi Talib (the brother of Ali) was located in al-Bāb. Until its rule by the Ayyubids in the 13th century, the town was populated mostly by Shias of the Ismaili sect. According to Yaqut al-Hamawi in 1226, it was a small town in the district of Aleppo. In the town were markets filled with cotton products called kirbas which were exported to Damascus and Egypt. The fourteenth-century historian Abu'l-Fida writes that al-Bab was a small town with a market, a bath, pleasant gardens, and a mosque (the Great Mosque of al-Bab). The fortunes of Al-Bab were shared with that of Aleppo when that city was conquered by the Ottoman Turks in 1516, and was administered as part of the Eyalet of Aleppo until 1866 and the Vilayet of Aleppo until January 1919, when the district was occupied by French troops and attached to the State of Aleppo within the French mandate of Syria. Until April 2012, Al-Bab had been relatively unscathed by the Syrian civil war. Between mid-May and mid-July, some 15 rebel groups formed within the city. The fight for Al-Bab included a series of raids and assaults on government offices over the course of two months, finally culminating on 18 July when rebels seized the final government stronghold within the city limits. According to opposition activists, an army garrison remained outside al-Bab and shelled the insurgents' positions. Rebel forces pushed the army from this garrison on the south edge of town on 29 July, With the seizure of al-Bab, the insurgents in northern Aleppo gained considerable momentum. The city's capture gave the militants full control of the areas northeast of Aleppo. However, in the summer of 2013 Islamic State of Iraq and the Levant had a presence in the town and by mid November, 2013, was in full control of Al-Bab. After the capture of Manbij by the Syrian Democratic Forces in August 2016, al-Bab was reported to be the next objective of the Syrian Democratic Forces (SDF) campaign. In December 2016, al-Bab came under an attack by Syrian rebels backed by Turkey. Turkish air strikes on December 21 destroyed 67 Islamic State targets; 14 Turkish soldiers and 138 rebels were reported killed. Al-Bab was a strategically important town for Turkey because it did not want the two SDF regions to link up. On 23 February 2017, al-Bab was captured by Turkish-backed rebels, becoming a part of the Turkish buffer zone. Al-Bab has a cold semi-arid climate (Köppen climate classification BSk) with influences of a continental climate during winter with hot dry summers and cool wet and occasionally snowy winters. The average high temperature in January is 8.3 °C (47 °F) and the average high temperature in July is 36.2 °C (97 °F), The snow usually falls in December or January. ^ a b "2004 Census Data for Nahiya al-Bab" (in Arabic). Syrian Central Bureau of Statistics. Retrieved 15 October 2015. Also available in English: UN OCHA. "2004 Census Data". Humanitarian Data Exchange. Retrieved 4 December 2015. ^ Khaddour, Kheder; Mazur, Kevin (Winter 2013). "The Struggle for Syria's Regions". Middle East Research and Information Project. Retrieved 27 August 2015. ^ Barrington Atlas, 2000, pl. 67 F4. ^ Batnai (Tell Batnan) Syria (Syria). ^ a b Le Strange, 1890, p.406. ^ McElroy, Damien. Syria dispatch: Rebels forced to share guns as Assad's tanks roll in to Aleppo. The Daily Telegraph. 2012-07-26. ^ Al Jazeera speaks to Syria secret police, Al Jazeera, 29 July 2012. ^ Rebels claim victory in Syria's al-Bab. Al Jazeera English. 2012-07-31. ^ McCormick, Ty. Morning Brief: Syrian rebels make gains in Aleppo, Al-Bab. Foreign Policy. 2012-07-31. ^ Paul Iddon (2016-08-15). "What happened to the race for Raqqa?". Rudaw. Retrieved 2016-08-15. ^ Tulay Karadeniz and Orhan Coskun (2016-12-21). "Battle for Syria's al-Bab intensifies, 14 Turkish soldiers killed: army". Reuters. ^ Balanche, Fabrice (2017-02-11). "Syria conflict: What is at stake in the battle of al-Bab?". BBC News. Retrieved 2017-02-11. ^  "Turkey-backed rebels in 'near full control' of Al Bab", Al Jazeera, 23 January 2017. ^ "World Weather Information Service – Aleppo". World Meteorological Organization. Retrieved 10 November 2012. ^ "Climatological Information for Aleppo, Syria". Hong Kong Observatory. Retrieved 10 November 2012. ^ "Average Conditions Al Bab, Syria". BBC Weather. Retrieved 10 November 2012.